So the end of the ice season has come for most of us, and for many areas in the country the search for pre spawn and spawning crappies has already come and gone. Here in the northeast, ice out on our lakes and ponds usually happens towards the end of March to mid April. With ice out, surface temps rise and the crappie start thinking about the next life cycle; the spawn. 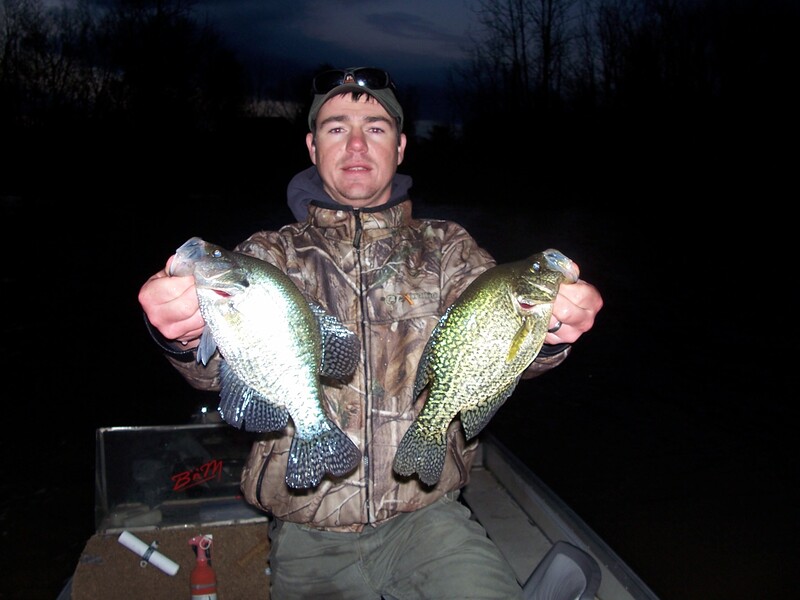 Crappie typically spawn in shallow sheltered water. Small cuts or setbacks off the main lakes are great places to look. These spots may not be fishable in the summer though. They have enough fishable water in the spring due to run off and rising water levels on the lake. At this point, the water levels flood shoreline brush making ideal spots for giant crappies to lay up in and spawn. I have caught fish in as little as 6″ of water. Ideal depths to look for are flats in the 4′-6′ range. Shelter and cover are key components to be mindful of. 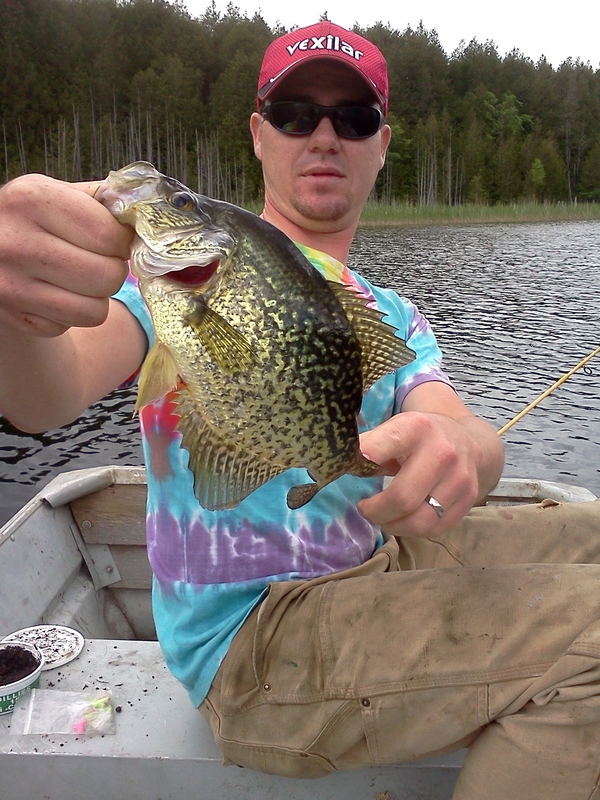 Crappie are lazy, they will look for the warmest water closest to their deep winter basin’s and weed flats. Brush and other structure also create great habitat for spawning and are sheltered from the wind and spring time chop on the lake. Pay very close attention to the surface temp. Crappies will start searching for spawning locations when the water starts to consistently hold in the low to mid 40’s, however they won’t actually start to spawn until it reaches the 60’s but it’s not unusual to see them spawning in the upper 50’s. One degree in temperature change can make all the difference in the world. Creeks and culverts flowing into the main lake are also great areas to be aware of. The afternoon bite is typically better since the daytime air temps have warmed the water up. Run-off water is warmer than the main lake temp creating another hot spot for ice out crappies. We use our Navionics to find cut backs and flowages on the lake when in search mode. Once we find them, we cast small jigs tipped with minnow under a bobber or a small micro plastics by Maki Plastics. Cast to the brush and pop the bobber back in. My spring time Crappie Fishing setup consists of a 7′-9′ noodle rod. I like the 7′ Eagle Claw and the 9′ Ultra Lite Rod made by Riversider. For shallow water I like to use the fixed Thill bobber made by Lindy. Under that I am usually running tungsten jigs from Bentley. Good luck out there searching, the fishing is going to get good real soon!